A great smile begins with childhood. We’re parents, and we know that when it comes to encouraging healthy dental habits, a dash of fun goes a long way. When your kids come to see us, they’ll get to know a friendly, gentle team with an entertaining approach to treatments that make a visit to the dentist something to genuinely look forward to. With a comfy, welcoming atmosphere, our waiting room is packed with colouring books and toys, and kids can even watch TV in the chair if they like. Parents are often surprised to learn of the huge impact of early breathing and oral habits on the healthy development of teeth, jaw and even facial structure in childhood. 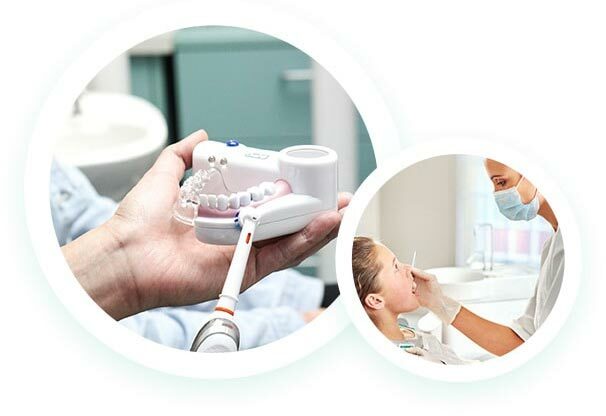 We’re enthusiastic advocates of the Myobrace system, a non-surgical, preventative treatment for children that corrects detrimental oral habits early on, for healthy growth of the jaw, optimal tooth alignment and better sleep habits. Wearing a Myobrace mouthguard for just a couple of hours a day gives your child the best chance of growing their jaw to the full size, allowing the teeth to come in straight and often eliminating the need for braces later on. Myobrace is a holistic treatment, improving not only the teeth but overall facial appearance. We recommend Myobrace as an early treatment, for children from 5-10 years of age. Ask us about the Child Dental Benefits Schedule, which covers general dental care for kids aged 2 to 17, meaning absolutely no out-of-pocket costs for treatments including checkups & cleaning, fillings, x-rays, extractions and even root canal. Kids can benefit hugely from early treatment to encourage good alignment and straighter teeth for a great smile in adulthood. At High Street Dental, we offer a range of orthodontic treatments for kids – contact our friendly team to learn more about how we can help your child attain a beautiful, confident smile that really lasts.